Looking for help? Let our friendly team be of service to you. Find us, conveniently located at the Management Office in the food court. Do you have a question right now for our Customer Service team? Do you need to contact Aviation Mall’s security team? Looking for your favorite shopping, dining or entertainment destination? You can visit any of our freestanding directories throughout Aviation Mall to find all that you’re looking for. Print directions are also located on the downloadable directory here. Stop at the mall office located in the food court to pick up visitor’s guides of the Adirondack Region, highlighting places to stay and things to do! We offer ATM’s located in various areas throughout the mall. You can find each one highlighted on the directories found here. Strollers are available for free of charge at the mall office throughout the week, and on weeknights and weekends by contacting our security team at 518.793.0768. Lost an item at Aviation Mall? Please call the Security Office at 518.793.0768. Pyramid Gift Cards are no longer available for purchase as of 1.31.18. Previously purchased cards can still be used within the mall. Please note there are no inactivity fees or other post-purchase fees and funds do not expire. Recipients may obtain a free replacement after the Card’s ‘valid thru’ date passes by visiting the previously mentioned websites or calling 800.297.5009. Terms & Conditions are applied to all gift cards. View restroom locations on our directory here. Designated parking at every mall entrance. Automatic doors equipped at every main entrance. Wheelchairs are available for free of charge in the mall office located in the food court on weekdays from 8:30am-5pm. Please call the security team at 518.793.0768 on weeknights after 5pm or weekends to borrow a wheelchair. 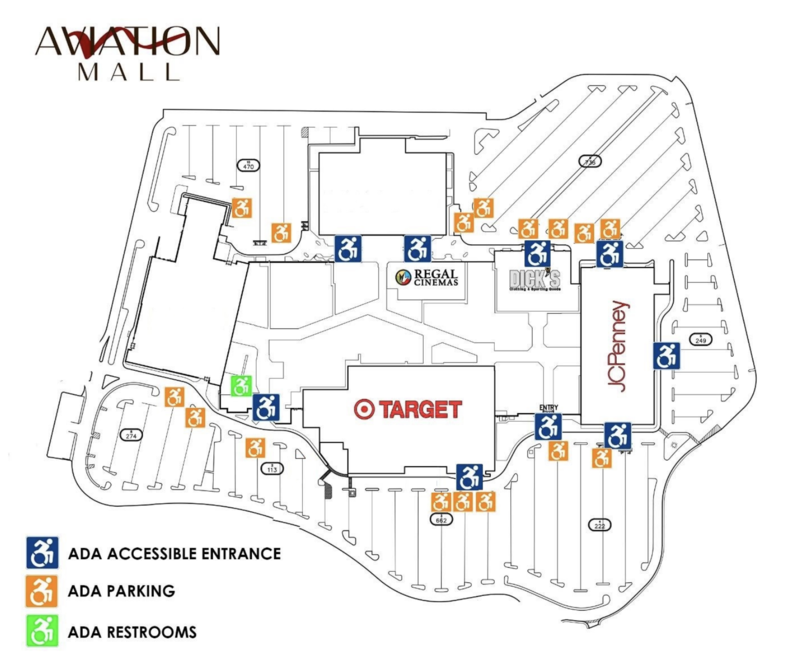 ADA accessible entrances are identified below and ample parking is available throughout the site. Thank you for shopping at Aviation Mall. In order to provide an enjoyable shopping environment, and for the safety and convenience of our shoppers, visitors and employees, the following Behavior Code will be in effect at all times for all guests and visitors of the shopping center. Anyone who violates the behavior code may be banned from the property and/or prosecuted to the fullest extent of the law. Mall management has the right to amend the behavior code at any time. Appropriate behavior is required at all times. Fighting, horseplay, harassment, offensive language, shouting, loud noise, littering, solicitation, or any illegal activities are not allowed on mall property. Mall management has the right to prohibit groups from congregating or walking in a manner that obstructs or hinders shoppers or mall visitors. Shopping Pets are not allowed on the premises except for service animals that aid the physically challenged. Exceptions may be made for pets being taken to pet stores or photography sessions. For your safety and the safety of our customers you may not run, skate or use a skateboard on mall property. You may not ride bicycles on sidewalks or in the interior of the mall. To promote the shopping center atmosphere, customers, guests and employees shall be fully clothed. The wearing of apparel which is likely to provoke a disturbance or embroil other groups or the general public in open conflict is prohibited. The possession of any weapon, unless authorized by local, state, or federal statue, is prohibited. Aviation Mall is a smoke free facility. The consumption of alcohol is permitted in licensed premises only. The parking area is private property and is intended for the use of mall guests, visitors and employees. Vehicles must be parked in legal designated spaces. Violators are subject to tickets and/or towing. Unauthorized overnight parking is not permitted and is also subject to towing. In accordance with school attendance laws, and in support of education, children of 6 to 16 years of age are not permitted on mall property during school hours, unless accompanied by a parent or legal guardian.